Lady Violet Deramore, née Blanche Violet Saltmarshe (d. 1973). Sitter: Lady Violet Deramore, née Blanche Violet Saltmarshe (d. 1973). Biog: Daughter of Col. Philip Saltmarshe, of Saltmarshe, Yorks. ; m. (1907), as his 2nd wife, Sir Robert Wilfrid de Yarburgh Bateson, 3rd Baron Deramore. 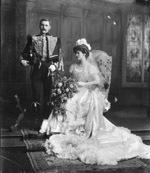 Occasion: The Court, 28 February 1908: presented, on her marriage, by the Hon. Mrs. Alfred Kerr. 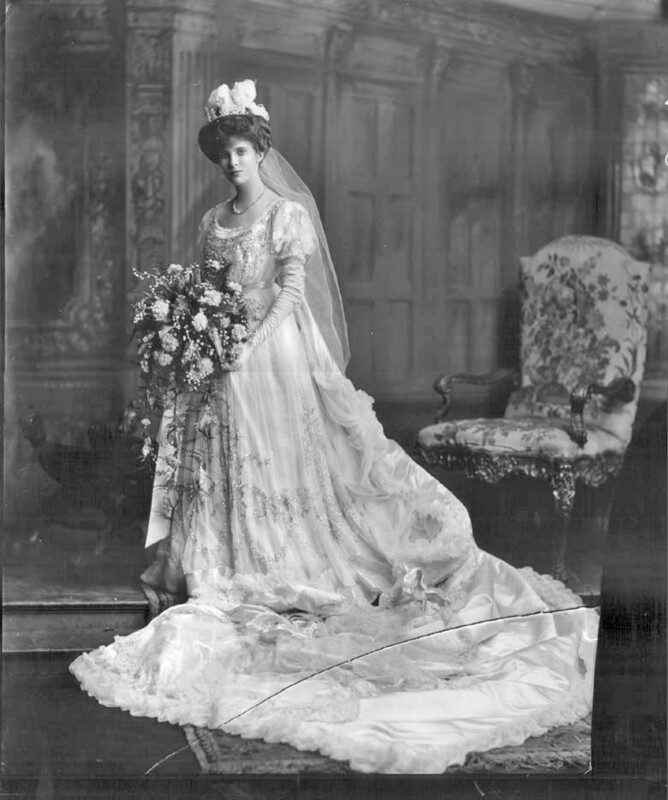 "An ideal Court gown of white chiffon and fine Brussels tulle embroidered all over with silver and crystal in a floral and basket design, the entire gown being finished with touches of cloth of silver. A white satin Court train, lined with cloth of silver and softened with white chiffon, draped from the shoulders with silver cords and tassels, and almost entirely veiled with very beautiful real lace" (see: The Court Journal, 29 February 1908, p 349). Costume Designer & Supplier: Russell and Allan, Old Bond Street, W.
Jewellery: Diamond tiara, stars and necklet. Biog: Burke's Peerage; The Times, 9 January 1973, p 14g. Occasion: The Times, 2 March 1908, p 4e. Costume: The Times, 29 February 1908, p 12c; The Court Journal, 29 February 1908, p 349; The Throne, 7 March 1908, p 260. Costume Designer & Supplier: The Court Journal, 29 February 1908, p 352. Jewellery: The Times, 29 February 1908, p 12c; The Throne, 7 March 1908, p 260.